Did you know that skin cancer is the most common cancer? It doesn’t need to be a growing problem. Skin cancer can be treated if caught early. Seek shade where possible, and avoid the summer sun during the middle of the day. Include dark colours, long sleeves, a wide-brimmed hat and UV-rated sunglasses. For children, look for clothing with inbuilt sun protection. Check that yours has a high protection factor against both UVA and UVB rays. Remember that sunscreen takes effect around half an hour after its application and only lasts for two to three hours. Children are at the greatest risk of long-term health issues related to unsafe sun exposure. Outside play is important, but you should never let a child get sunburnt. Who is at risk of skin cancer? If you see two or more of these warning signs, don’t delay. Visit your doctor immediately. This is the least common form of skin cancer, but also the most dangerous. It can affect people of any age, unlike other types that are more common among older people. It presents as a spot that becomes darkly pigmented or develops irregular edges or different colours over time, or as a rapidly-growing pink or red lump. It can spread internally, so immediate treatment is required. This is the most common form of skin cancer, but also the least dangerous. 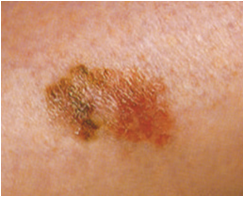 It typically presents as an elevated skin-coloured lump with a shiny, pearl-like edge, a wound that does not heal, or a slightly crusty lump that grows slowly over time. If left untreated, it may ulcerate and invade deeper tissues. lump which may grow quickly and become ulcerated and weepy. It can spread rapidly, especially if on the lips, ears, ﬁ ngers and toes, or in immunosuppressed patients. 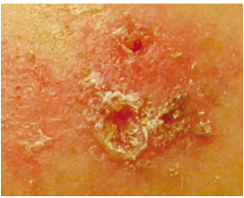 Surgical treatment to remove the lesions is essential. This occurs most commonly in middle-aged and elderly people, on areas most exposed to the sun such as the face, neck, ears, back of the hands and scalp. It presents as red-brown scaly and rough patches of skin. 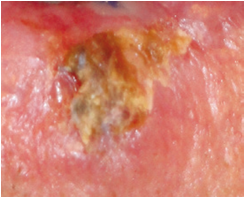 The lesions are pre-cancerous; in 10 – 15% of cases they may develop into squamous cell carcinomas, so they should be treated to prevent progression. 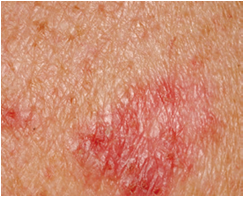 Because melanoma is particularly serious, you should be familiar with the signs to look for. Check your skin once a month for any changes or for suspicious-looking spots. Your check should cover your whole body, front and back, with particular emphasis on areas exposed to the sun. Stand in front of a full-length mirror with a hand mirror for those hard-to-reach places. Look at your face, including your nose, lips, mouth and on and behind your ears. Check your scalp, using a comb to part your hair in layers. If you do not have much hair, be sure to check your entire scalp very thoroughly. Check the front and back of your hands and in between your fingers. Then focus on your neck, chest and upper body. Women, be sure to check between and underneath your breasts. Bend your elbow to check your upper arm and armpits. Use your hand mirror to check the back of your neck and your back, top and bottom. Check your buttocks and the back of your legs. Finish by checking the soles of your feet and in between your toes. Skin cancer can affect anybody at any age. It is most common in people over 50, or people who have had prolonged exposure to the sun. do now to protect you and your family from skin cancer. 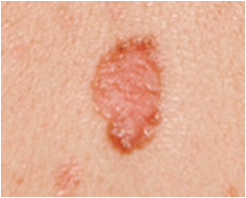 suspicious skin lesions before they become something more serious. 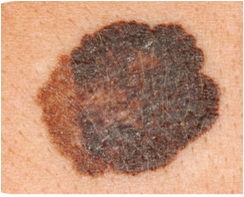 Skin cancer can be treated, and early diagnosis makes the chances of a full recovery very high. If you spot a suspicious lesion, it is vital that you have it checked by a doctor or preferably a dermatologist as soon as possible. Where treatment is delayed, the condition worsens, and in some instances, can lead to disfi gurement, complications and even death. Don’t let delay reduce your chances of a positive outcome. 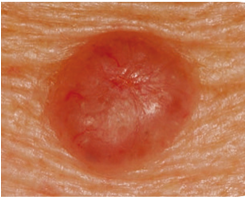 Skin cancer is treatable if it’s caught early. If you have a spot that looks suspicious, go and see your doctor. 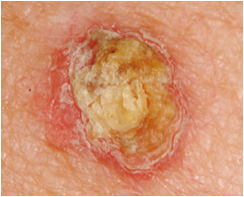 For more information about skin cancer, and how to prevent and detect it, visit www.euromelanoma.org.